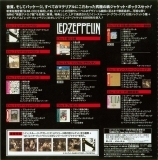 The Japanese release was limited to 2,000 sets includes all original UK covers including variations of In Through the Out Door. It appears that the non-Japanese release (of another x,000) is not quite so limited and in fact may be identical. There are many fake versions of this box on the market. 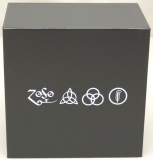 See Fake Led Zeppelin - 40th Anniversary Definitive Collection (Zoso Box) for specifics. yes these are good, it's too bad they used remastered versions, as we all know are usually victims of the loudness wars, like these are! the attention to details on this series is simply mind blowing. Compared to the 1997 and 2001 edition (already a very fine job), this latest series is exceptional. 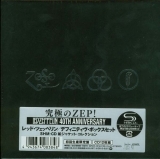 Zeppelin III and Physical Graffiti are near perfect reproductions of the original U.K lp album covers. Obi:Large spine and back wrap around. 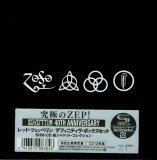 Cover:The front and the back of the box are identical - embossed silver Zoso elbems (reflective so does not scan well).